These simple and delicious vegan friendly pancakes are made even more special with a generous serving of freshly sliced peaches and whipped coconut cream on top. Gluten-free variation also included! I’m definitely more of a sweet than savory breakfast sort of gal. Whenever we go out for breakfast or brunch it’s almost guaranteed that the kids and I will end up ordering a combination of pancakes, waffles, or french toast, and Rafael usually orders some sort of omelet or breakfast platter. It’s the best of both worlds for me because I’ll end up eating some of his savory breakfast, while he takes a few bites of mine…so glad my hubby’s not weird about sharing food! My absolute favorite type of pancake is classic buttermilk. It gives the pancakes some extra fluff and it is sooooo yummy with a pat of melty butter and warm maple syrup. Since becoming lactose intolerant several years ago, I now only buy real buttermilk once in a blue moon, usually when we have guests staying over. If it’s just us, I make sour milk—which is the buttermilk replacement—by mixing almond milk with vinegar. It adds that same tang that buttermilk gives and makes them nice and fluffy. Eggs usually give a bit of rise too, but sometimes can make pancakes rubbery, in my opinion, so I omitted them and prefer the taste of these pancakes sans eggs. It also makes them vegan friendly too, so win-win! 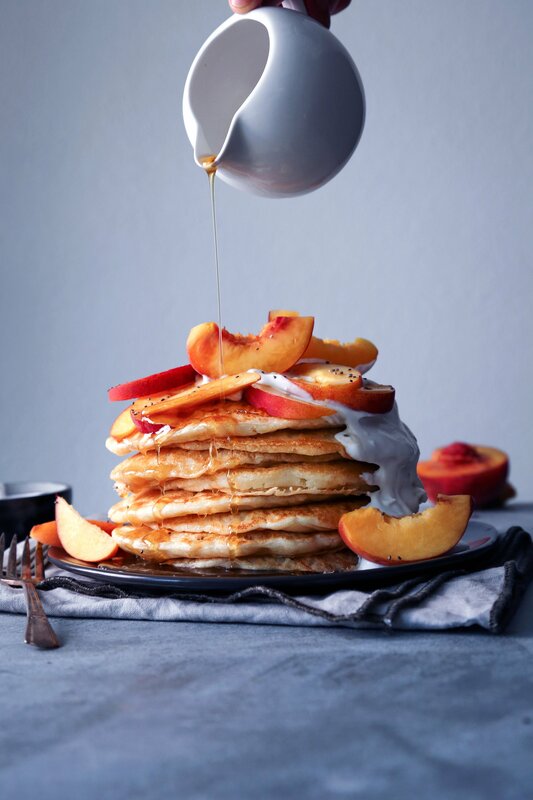 You can most definitely enjoy these plain with a drizzle of maple syrup, but I LOVE pancakes with fresh fruit, so we topped them with peaches & cream. They’d be amazing with fresh berries too! However you prefer to top your stack, I hope you gives these a try and enjoy them as much as we did! These simple and delicious pancakes are made even more special with a generous serving of freshly sliced peaches and whipped coconut cream on top. Gluten-free variation included. coconut oil or other high heat oil for greasing the skillet. Begin by making the sour milk. Combine milk with vinegar in a large glass measuring cup or glass and set aside for a few minutes to sour. To prepare the whipped cream, open the can of chilled coconut milk, scoop out the firm cream and place into a medium mixing bowl. Careful to only get the firm white cream and not any of the water. You can discard the remaining water or save to use in a smoothie. Use a whisk or electric hand mixer to beat the white cream until fluffy. Add 1 tablespoon of the maple syrup and continue to beat until thoroughly combined. Refrigerate until ready to use. In a large mixing bowl, blend together flour, baking powder and salt. Stir in melted butter, 2 tablespoons maple syrup, and vanilla. Slowly begin to pour in sour milk, whisking as you pour to remove lumps. Stir just until wet and dry ingredients are combined. If batter is too thin for your liking, just stir in a few extra tablespoons of flour. Preheat a non-stick skillet or griddle on medium-high heat. Coat the pan with a little coconut oil to keep the pancakes from sticking. Pour batter by the ⅓–1/2 cupfuls onto the hot skillet. Let cook for 1–2 minutes, flip and continue to cook until pancake is fully cooked in the middle. Repeat until all the batter is gone. Makes 10–12 large pancakes. Top pancakes with a dollop of whipped coconut cream and fresh peaches. Makes 4–5 servings. This looks great! I’m trying to cook more paleo, and it’s nice to have a breakfast option besides EGGS! Thanks!! Good work Joscelyn! I know what ill be making on the weekend.. I love peaches and cream but on top of pancakes makes it even better! I’ve never tried making pancakes without eggs before so I’m looking forward to trying your recipe. I’ve done the dairy substitute, where I use coconut milk. Your food photography is beautiful! Thanks Jen. Please let me know how you like this recipe! I know what I’m making for breakfast this weekend. So yummy! Yay! Thanks for trying it out! Thank you for pinning, Mayuri. My daughter loves pancakes too. These pancakes looks absolutely delicious and the sauce on it is so inviting. Thank you for sharing it. I love all of these pancakes!!! Yum!!! Those pancakes look too good to eat! I have had vegan pancakes once and I loved them. I’ll have to try this recipe out. Yes, they’re so good. Thanks Brittnee! My mouth is watering this looks so AMAZING! Anything is awesome with peaches and cream but you made these look extra scrumptious! Love the other variants too. Yes, for sure. Thanks Pooja! Yum those look so good! I will def have to give these a try! Great pictures too! I love peaches with my pancakes. This looks super amazing! How in the world are these vegan?! I need to make these this weekend! I love vegan pancakes and the peaches really top this off! I am definitely pinning this for later, hoping to make them this weekend! I love a good breakfast recipe…. mmm! Thanks, Joy! Please let me know how you like them! These look so delicious! My boyfriend and I usually have pancakes on Saturday morning’s and since I recently made the decision to go Vegan, I was worried I wouldn’t be able to have pancakes with him anymore. Hi Krysta! Thanks for you comment. It’s sometimes difficult to find a great-tasting vegan pancakes. I really hope you like this recipe. Please let me know if there are any other recipes on the blog I can help you find. These look phenomenol! I definitely want to try with coconut and almond milk — I feel like it’ll taste even better than regular pancakes!